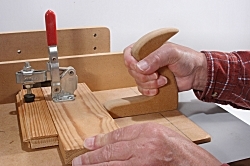 Many routing work aids are easier to use if they have a substantial handle with which to guide them. I make handles from a pattern that I made from the handle of my smoothing plane. 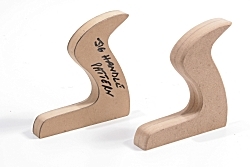 The new handle is rough-cut from MDF and the pattern taped to it and shaped with a flush trimming cutter in a router table. After shaping, the sharp edges are softened with a small-diameter round over cutter.